“The National Budget must be balanced. The Public Debt must be reduced; the arrogance of the authorities must be moderated and controlled. Payments to foreign governments must be reduced, if the Nation does not want to go bankrupt. People must again learn to work, instead of living on public assistance.” …..Marcus Tullius Cicero (+/- 55 BC). The current correction in gold started in August 2011 and has now gone on for 112 weeks – (it most likely bottomed on June 28th). This has been the longest correction since the current bull market started in 2002. The correction of 2006 lasted 71 weeks before a new high was reached. There followed then a 50% price rise, (+85% from bottom to the next top). The correction of 2008 took 77 weeks before a new high was reached. The gold price then advanced by 80%, (+325% from bottom to next top). The expectation is for gold to advance by more than 50% as in 2006-2008, and more than 80% as in 2008-2011 during this next ‘leg up’, because of the depth of the current pullback. Because of blatant manipulation of the gold price by large traders dumping oversized lumps of futures contracts during hours when trading is usually sparse; the price of gold is starting this next rally below its normal starting point. This is likely to cause the price to act in slingshot fashion, and may very well surprise a lot of people. The US debt ceiling has just been pushed upward for the 79th time since 1960, and right after the last raise in 2011, the price of gold rose +17% between August 1st ($1620), and August 22nd ($1898) – that was +17% in just three weeks! A similar reaction by gold at this time could result in price rising quickly from $1281 to $1498. 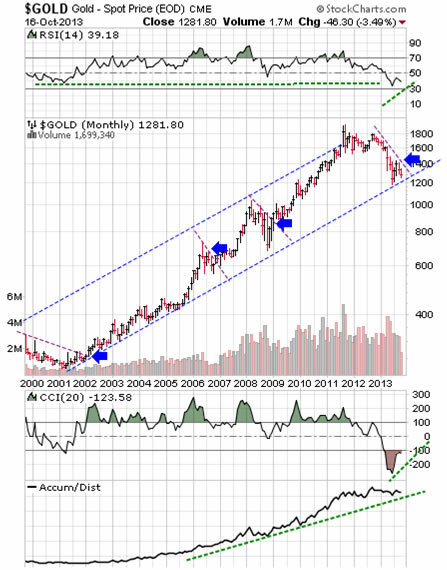 Here is the gold chart that records the beginning of the current bull market, along with three upside breakouts and the expectation for the next breakout, marked by arrows. (Charts courtesy www.stockcharts.com unless indicated). 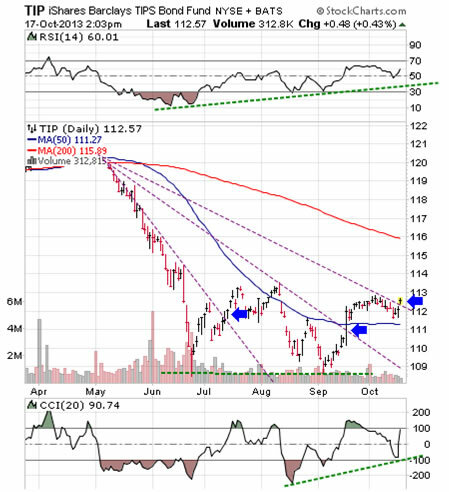 The RSI (at top of chart) is ready to rise, the CCI (at upper bottom) is rising from oversold conditions, and the A/C line at the lower bottom is still in uptrend after merely leveling out. 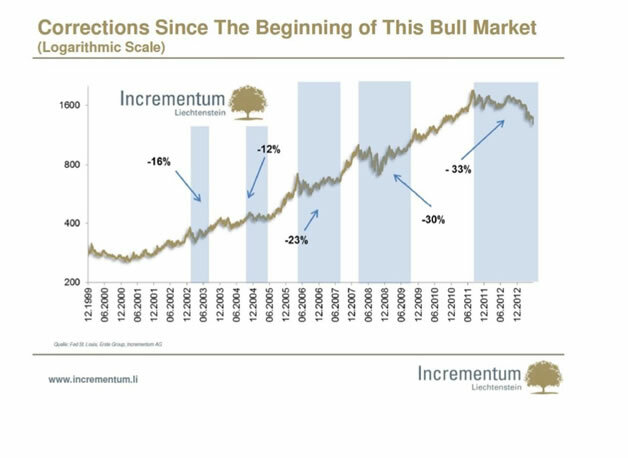 This chart courtesy Incrementum.li shows us that the current correction in the gold price is not unusual, if we accept the principle that the higher the price, the larger the pullback. 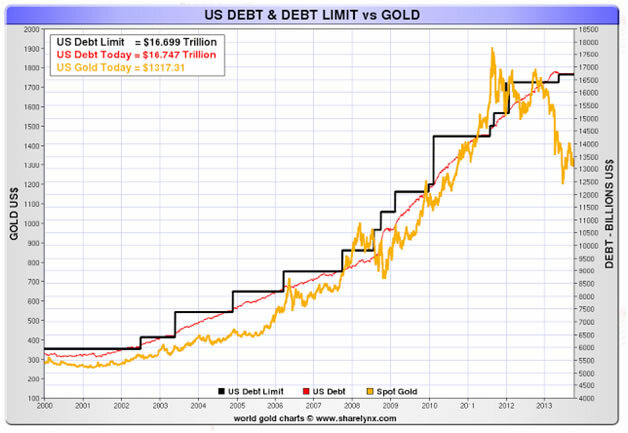 This chart courtesy Sharelynx.com shows a gap that has opened up between the US debt limit and the price of gold. Unless we expect the debt limit to be lowered, (how likely is that), we better prepare our portfolio for a rise in the price of gold, as the rubber band effect takes hold. 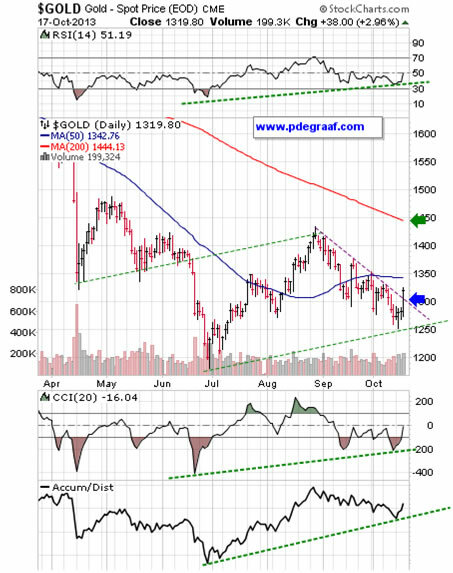 Featured is the daily gold chart. Price is carving out a rising channel that is anchored by two upside reversals (June 28th and Oct 15th). On Oct. 17th price broke out from beneath three months of resistance, with a target at the 200DMA. The three supporting indicators have all turned positive, including the Accumulation/Distribution line. The Gold Direction Indicator (for details www.pdegraaf.com), turned bullish at 55%, compared to 44% on Wednesday. 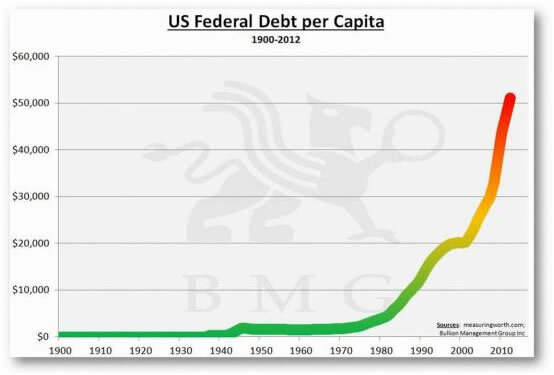 This chart courtesy BMGBullion.com shows the US Federal Debt on a per capita basis. This debt cannot be paid off – it will be inflated away. Gold and silver will be sought as protection against this inflation. This chart courtesy Mark J. Lundeen shows the number of US dollar bills in circulation, compared to the number of ounces of gold supposedly stored at Fort Knox. (These gold ounces have not been audited since 1953). Here is the long-term chart for silver, along with the breakout points after a correction takes place, marked with arrows, including the expectation for the next breakout. The three supporting indicators are beginning to rise up from support levels. 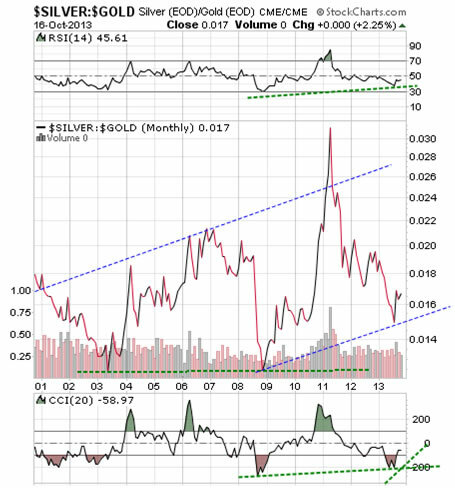 Featured is the index that compares silver to gold. 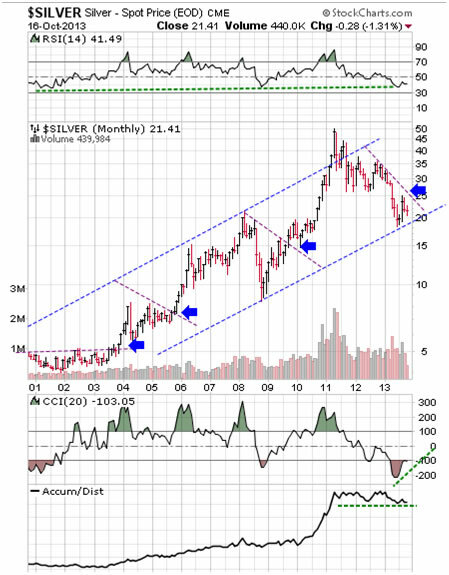 Since the second leg in the double bottoms of 2003 and 2008, the trend has favored silver over gold. The two supporting indicators are turning positive. The target for the current bounce is at the top of the blue channel. Featured is the daily bar chart for TIP the bond fund that is indexed for inflation. The price dropped sharply in May and June when it was thought that the FED might reduce its bond purchases (TIPs are bonds after all). Recently however the people who buy TIPs are sniffing the first whiffs of price inflation, and the arrows point to breakouts while the supporting indicators are positive. 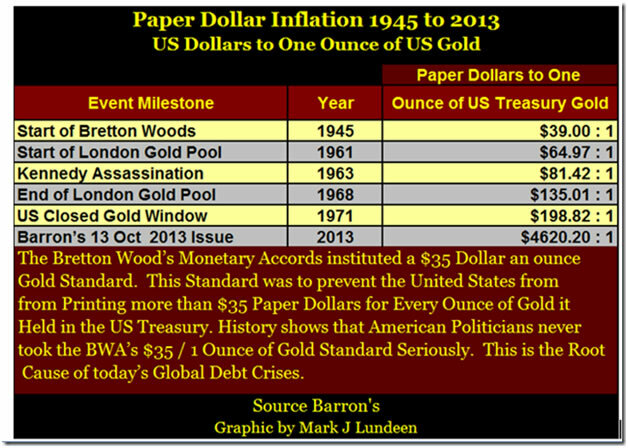 Price inflation is the delayed result of monetary inflation and a source of energy for gold and silver to rise. “The truly Unique Power of a Central Bank, after all, is the power to create money, and ultimately the power to create is the power to destroy.” …..Paul Volcker, US FED Chairman 1979 – 1987.